CHICAGO (Feb. 5, 2019) - The floor of the 2019 Chicago Auto Show will serve as the backdrop for five different television specials: ABC 7 Chicago, CBS 2 Chicago and WGN-TV are each producing live specials that will air on the show's opening Saturday, Feb. 9, and Sunday, Feb. 10, and Telemundo Chicago is producing an opening weekend special and a "Best of the Chicago Auto Show" special on the show's closing weekend. Additionally, NBC 5 Chicago will produce special event coverage throughout the day on the show's opening Saturday. "The Chicago Auto Show provides the perfect canvas upon which to create engaging live television," said Chicago Auto Show Chairman Ray Scarpelli Jr. "Last year, the CBS 2 Chicago Auto Show special, entitled 'Chicago Auto Show: Inside Track,' won the Midwest Emmy for Outstanding Achievement for Special Event Coverage." 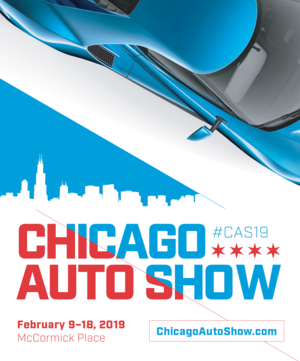 "ABC 7 is proud to showcase the Chicago Automobile Trade Association's 2019 Chicago Auto Show as the official broadcast partner" said John Idler, president and general manager of ABC 7 Chicago. "The auto show has become the nation's premier consumer automotive event, and ABC 7's live auto show special brings the viewers an inside look into the technology and innovations that drive the automotive industry. We are also honored to team up with Chicago area new-car dealers who have been outstanding civic partners, lending support to local schools, youth athletics and local charities to make their communities a better place to live." The TV specials are an important part of the Chicago Auto Show's industry-leading awareness level - one that regularly tops 90 percent. Chicago Auto Show organizers work hand-in-hand with each of the broadcast networks to provide 24-hour to the access to the show floor and assist in arranging interviews with key industry leaders. About the Chicago Auto Show The Chicago Auto Show is the largest auto show in North America, spanning more than 1 million square feet of production, concept and exotic vehicle exhibit space. In addition to hosting multiple world and North American vehicle debuts, the Chicago Auto Show's First Look for Charity raises more than $2.5 million annually for 18 vital Chicago organizations in a single night. The 2019 public show is Feb. 9-18. For more information, visit www.ChicagoAutoShow.com or www.Facebook.com/ChicagoAutoShow. About the Chicago Automobile Trade Association Founded in 1904, the Chicago Automobile Trade Association is one of the nation's largest metropolitan dealer organizations. It is comprised of more than 420 franchised new-car dealers and an additional 150 allied members. The group's dealer members employ about 19,000 people in the metropolitan area. The association has produced the world-famous Chicago Auto Show since 1935. For more information please visit www.CATA.info.